Allowing mangrove forests to recover naturally result in more resilient habitats that benefit both wildlife and people, say conservationists. In Indonesia, a Wetlands International project uses permeable dams to restore sediment needed for the trees to grow. The charity says early results suggest "ecological restoration" is more effective than planting programmes. More than half of the world's most at-risk habitats have been felled or lost over the past century, UN data shows. Mangroves are a group of about 80 different salt-tolerant species of trees that are able to live along the intertidal zones of coastlines in tropical and sub-tropical regions. The characteristic root systems of these trees allow them to withstand the ebb and flow of daily tides. The roots also act as buffers, slowing the flow of the tidal waters, allowing sediment to settle and build up as nutrient-rich mud. The unique habitats provide valuable shelter and breeding sites for fish, as well as stabilising coastlines, reducing erosion from storm surges and tsunamis. A report by the International Union for Conservation of Nature (IUCN) shortly after the 2004 Asia tsunami, which killed more than 200,000 people in nations lining the Indian Ocean, highlighted how in-tact mangrove forests provided protection to coastal communities. It reported that two people were killed in a Sri Lankan village with dense mangrove and scrub forest, but up to 6,000 people lost their lives in a settlement that was no longer protected by similar vegetation. Following the 2004 tsunami, the importance of robust and resilient mangrove forests became widely recognised, explained Femke Tonneijck, Wetlands International's programme manager for coastal wetlands. "This resulted in many mangrove restoration efforts around the world, many of which were implemented through planting programmes by NGOs, governments and business," she said. "Now we are seeing that many of those planting efforts are failing, and there are a number of reasons for this. "One of the most important reasons is that there is a wrong species-to-site match because mangroves have a natural [gradient] from land to sea, in which there is a mix of species that are best adapted to the level of salinity, wave exposure and submergence. 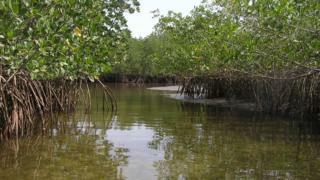 "This is why we now focus more on ecological mangrove restoration," Ms Tonneijck told BBC News. She said researchers had been carrying out a series of studies on this approach to conservation and it had been shown to deliver "much better results". "This is because if you have a mix of natural species, ages and root types, as well as different types of fruit, fodder and timber, the diversity makes the system more resilient, as well as a forest that offers multiple benefits to a diverse group of stakeholders, as there are different species of fish taking shelter in the different root systems," she added. However, planting programmes still remained popular because many schemes, often government-funded, measured success on the number of trees planted rather than the longer term survival rate. "Also, there is no measurement of ecosystem services returning, such as coastal protection, and this may give people a false sense of protection," Ms Tonneijck warned. In 2011, Wetlands International was invited to undertake a ecological mangrove restoration project in Central Java by the Indonesian government's marine and fisheries department. Two villages in the area had been lost and the sea was encroaching inland up to three kilometres, destroying arable land. Ms Tonneijck explained how the team restored the conditions needed for the mangrove to return to landscape. "Working with Deltares, the Dutch knowledge institute, we were inspired by Dutch and German marshes where land was regained by putting permeable dams in place," she recalled. "These permeable structures let waves pass through with sediment and behind the structures the sediment can settle. Once it had settled then the mangroves were able to come back into the area. "We started first with a small pilot, and as the sediment trapping worked really well, we decided to set up a larger project that was supported by Dutch funds and the Indonesian government as well." Wetland International's Building with Nature programme is now looking at restoring the "mangrove greenbelt" throughout the district. "In the area where it is eroding, we are applying these permeable dams and we have already placed two kilometres of them," Ms Tonneijck revealed. "As well as the mangroves slowly coming back in, we are also seeing that people are becoming very enthusiastic and they really want to do something - people immediately want to start planting as soon as there is sedimentation. "So we have started a dialogue explaining why we are preferring to wait for nature to come back."